Paul Stenton, deputy provost and vice-provost, speaks at a town hall budget meeting. 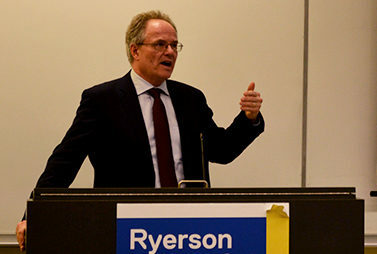 Ryerson has hosted three town hall budget meetings this month. And there was a common theme at each — students are frustrated with the budget process. But that’s quite misleading. Paul Stenton, deputy provost and vice-provost, has presented at each town hall to supply context for the upcoming budget. He has spoken for nearly an hour each time with the same script and Powerpoint slides. He left approximately 10 minutes for questions and comments. Ten minutes does not seem like enough time to consider these meetings a “discussion.” Instead, they’re best described as a jargon-filled presentation, which isn’t very accessible for the average student. At the first meeting, only 14 people attended and only one asked a question. Most appeared to be faculty members. The second meeting seemed a little more balanced, with 23 people in attendance. A few more comments and opinions were heard. The third meeting, on Monday, was much more lively than the previous ones. Several students arrived late, which prompted Stenton to restart the presentation. One student mentioned the very long wait times to see a counsellor (nearly three months). Another spoke about the terrible quality of online courses. Stenton often replied with only a “thank you” before moving on to the next speaker. Those words were not satisfying. It felt as if each concern expressed would later be forgotten and the only objective of hosting the meeting was to say that they did. But do students actually have any power to effect change in the budget? It’s doubtful. A Ryerson Students’ Union alternative budget was rejected just last year. Vajdaan Tanveer, a third-year politics student, said it’s important for students to keep trying.